Like all great EAA events, the AirVenture Cup is brought to you by volunteers. Born of an idea hatched in Camp Sholler during the 1997 convention by lifelong EAA Volunteers, Eric Whyte and Erik Anderson, the first AirVenture Cup was in 1998. 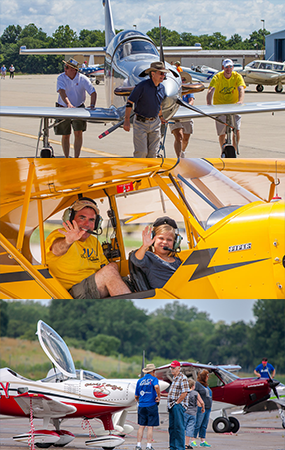 Since then more than one hundred volunteers have established a tradition of bringing cross country air racing to our fellow EAA members. It takes a lot of manpower to execute on an event that spans 500 miles, 3 days, 4 airports, and routinely sees nearly 100 airplanes, both racers and support aircraft. From planning, marketing, and technology, to flight operations, banquets, timing, and recovery in Oshkosh, work for this event is an all year commitment for many of our volunteers and a very busy weekend for everyone. We are always looking for more volunteers. One place that the AirVenture Cup Racers can really help is in our race tent during AirVenture. The race tent is a focal point for the event and when spectators or perspective racers come by, it is nice for them to hear about the race from a race pilot or co-pilot’s perspective. A sign up sheet to volunteer to staff the tent will be available at race check in in Mitchell. We are grateful for any time that you can commit. We also have other opportunities for people to get involved during the “off season,” specifically with administrative, technology (web) projects, and marketing. If you have talents in these areas and would like to get involved as a volunteer for the AirVenture Cup you can contact Eric Whyte or Joe Coraggio. On behalf of the AirVenture Cup Chairman, Eric Whyte, the race staff, and our racers, we would like to send out our heartfelt gratitude to everyone who helps make this event a success. Without a talented group of giving volunteers, this event would not be possible. No matter what your role, your contribution enhances the experience for everyone involved and we thank you.